We are always on the lookout for great carry on luggage. And, let’s be honest, most of the stuff out there is not great. Especially in the more affordable cost category you have a lot of poorly designed and badly constructed suitcases. That means when we find a bag that actually is very durable, for a good price, we take notice. That is the case with the bag we are reviewing today. 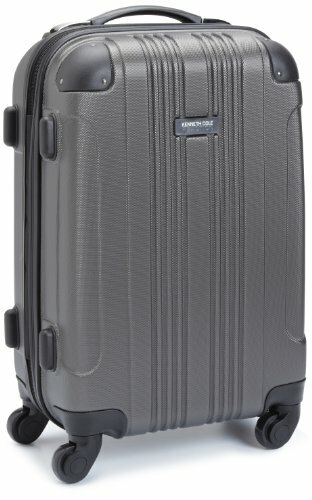 This is our Kenneth Cole Reaction spinner carry on review. Technically this bag’s full name is the Kenneth Cole Reaction Out of Bounds but we will shorten it to the Reaction during this review. The Kenneth Cole Reaction spinner carry on doesn't reinvent the whole industry. But what is does do is make quality carry on bags available to the masses. If you want something feature rich though. look elsewhere. We aren’t going to write thousands of words about all of the features on this bag. That’s because to be honest, it is a very basic carry on bag. But the real story with the Kenneth Cole Reaction is in its incredible value. The outside of the bag is made from mostly ABS plastic. This design allows for very good durability against bumps, scratches and cracks. In our tests with similar ABS bags, they were pretty hard to damage in any way. We’d say that more expensive polycarbonate-based bags are probably even a bit more durable, but ABS does a great job of protecting you contents and resisting damage. Add to that small black bumpers on all of the corners of the bag and you have a nice exterior that should ensure that this bag lasts a long time under normal use. The handles on this bag aren’t anything to write home about, but are certainly comfortable and feel relatively durable. You shouldn’t have an issue stowing and pulling down your bag from the overhead bins. One interesting thing about this particular bag is how the outer shell is designed to allow this bag to be able to stand upright on its side. It is flat enough on its side to make this possible. Surprisingly most bags aren’t able to boast this feature. A great upgrade to this bag that is both more durable and way more feature rich is the TravelPro Magna 2. This is the bag we highly recommend to anyone traveling for business or who travel a lot. The retractable pull handle is good, not great. It has a bit of wobble to it, but again, this is a basic carry on bag that is very affordable. The wheels are small spinner style wheels. They aren’t fully recessed, which could cause damage to them in the long run. More expensive bags will often recess the wheels a great deal to lessen the chance of broken wheel housings. Having said that, these wheels performed very well within an airport/security scenario. They glided over the ground with no issue at all. The wheels are a little small to be effective on rougher terrain, but that isn’t what you should buy this bag for anyway. The interior of the Kenneth Cole Reaction carry on is in a clamshell design which features 50% storage on each side of the bag when it is open. One side is fully zipped to allow maximum organization (as well as easy stowing of garment bags) and the other is a more all-purpose storage space equipped with a basic set of compression straps to keep everything stable. Unlike Briggs & Riley, who feature the “outsider handle” on their bags, the Reaction has a more run of the mill design where the pull handle takes up valuable space inside the bag as two long humps down the interior. This isn’t ideal, but it isn’t any worse than any other carry on bag that features internally stowed handle channels. The whole bag without anything in it weighs in at just over 6 pounds. This is pretty good for a hard shell bag and is actually quite a bit lighter than more expensive bags in this category. Overall, for the money this bag is an absolute steal. Sure, there isn’t anything incredibly exciting about it, but what it does do it does very well. The warranty on the Kenneth Cole Reaction carry is just okay. It is a lifetime limited warranty that covers manufacturer defect but not damage by airlines or with normal use like Briggs & Riley does. Kenneth Cole Reaction spinner carry on review round-up: Should I buy this bag? Maybe. This is a great basic bag for most people. But if you want anything in terms of space-saving or convenience features you may want to look to the more expensive bags that are designed with business travelers and frequent flyers in mind.